Scenery for Beccy Pulp Mill and Beauville. 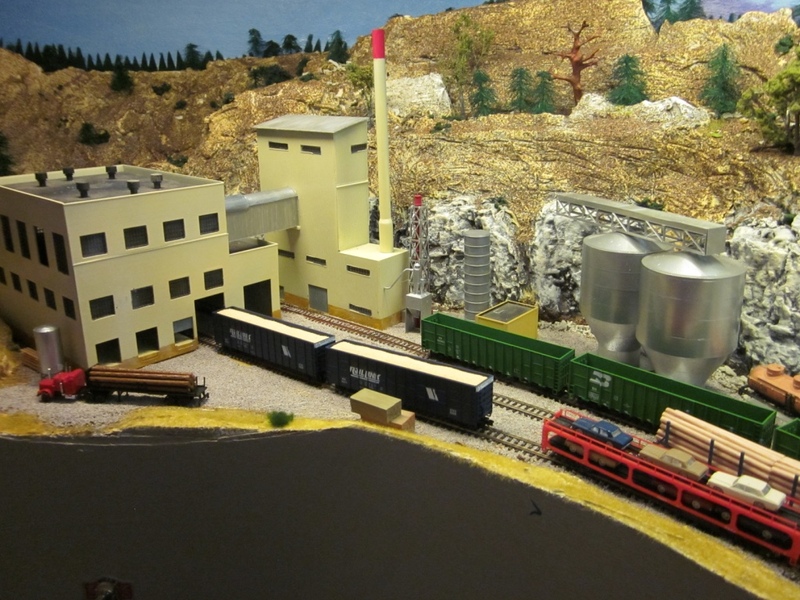 I am off to the N Scale convention in Kansas City and the NMRA convention in Indianapolis tomorrow, so there will be no further work on the layout for 3 weeks. 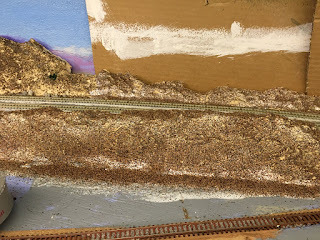 I have just finished two areas with scenery and ballasting and weathering of the tracks and felt I should record that. 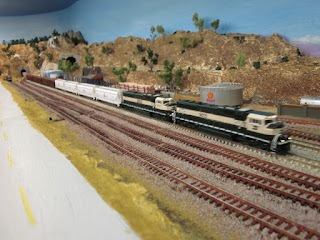 Here is the development and several pictures to show how this progressed. Hopefully this will add more interest for future operating sessions. I have two trolleys - one for track work materials and tools and one for scenery. 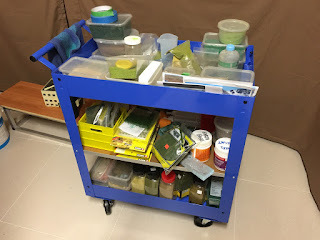 This can go with me as I work and keeps the materials relatively tidy. Here is the scenery trolley. As I started this section I did largely follow best practices in preparation. 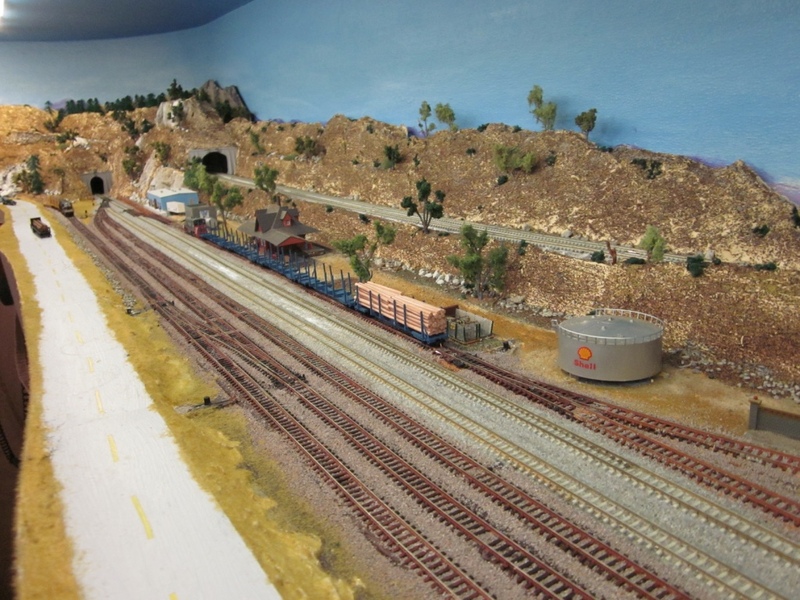 It is important to mask the track, and structures like tunnel portals. I use painter's tape. 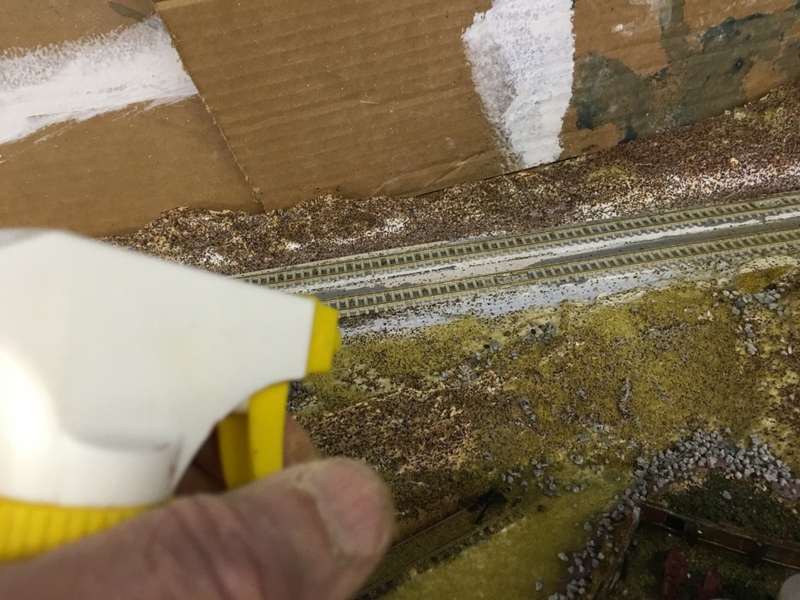 From experience do not use masking tape, as it leaves the sticky parts on the structure and track. 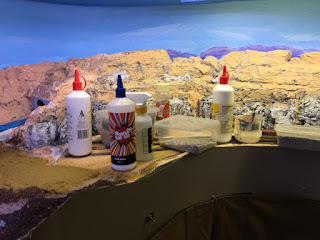 For the base I use 100% PVA glue to glue down all the materials. For "wetting" the scenery I use 50/50 alcohol and water. 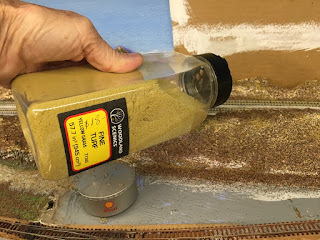 For the top layer of glue once all the talis, weeds and branches are added to the scenery base I use 50/50 PVA and water from a dripper bottle, or applied using a pipet. I had painted the background beforehand so wanted to protect that. 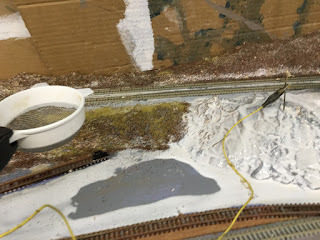 To do so I slipped cardboard down the back of the scenery. 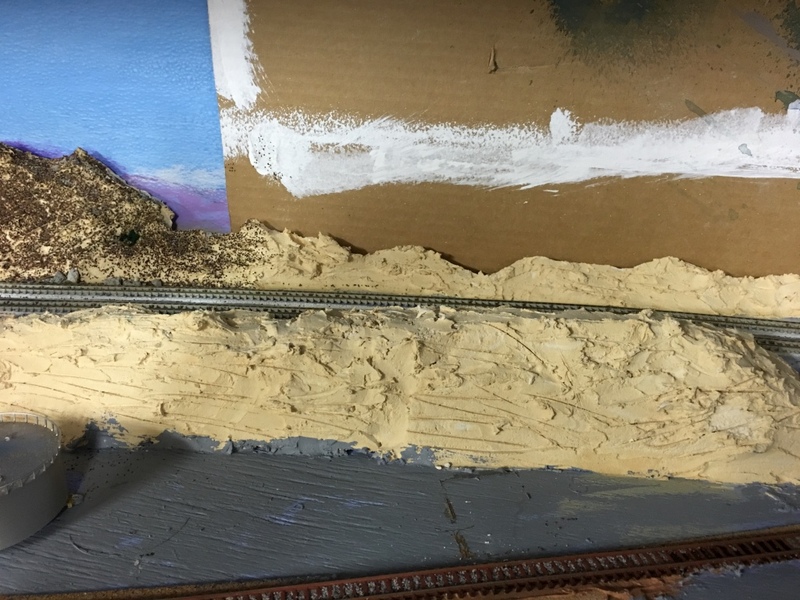 The terrain does not attach to the wall so there is a small gap to enable the cardboard to fit. In places where I had photo backdrops mounted on foam core, I removed these during this process. Woodland Scenics and others like Heki make some excellent materials. 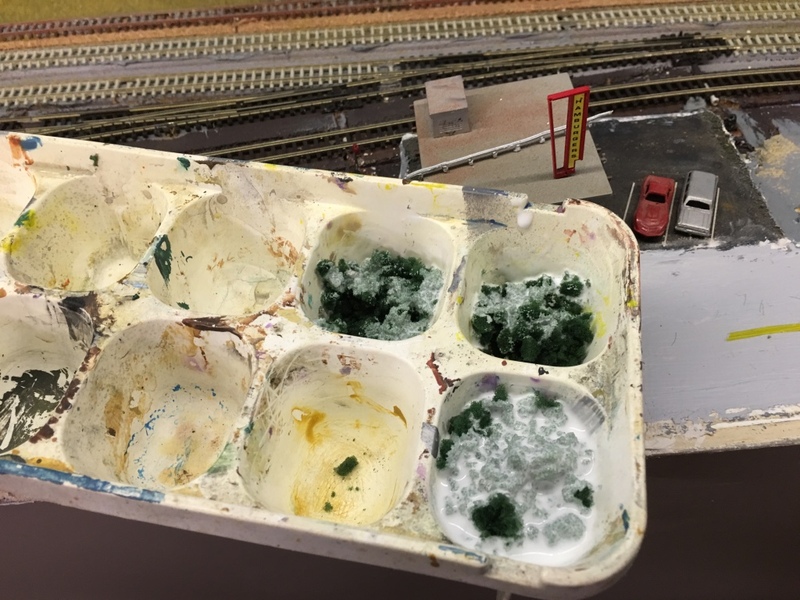 It is important to be consistent in the type and colour to get a common feel to the finished scenery. The first phase is to cover the area being addressed with concentrated white glue (PVA). Don't do too much in one go. I work in 30-50cm (1-2 feet) areas at a time. Once the white glue is applied I use a cheap brush to spread it evenly. 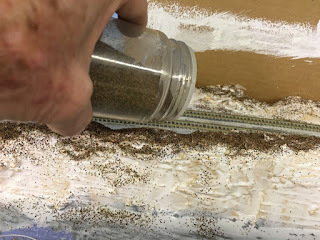 Then using a sifter apply the base ground cover. 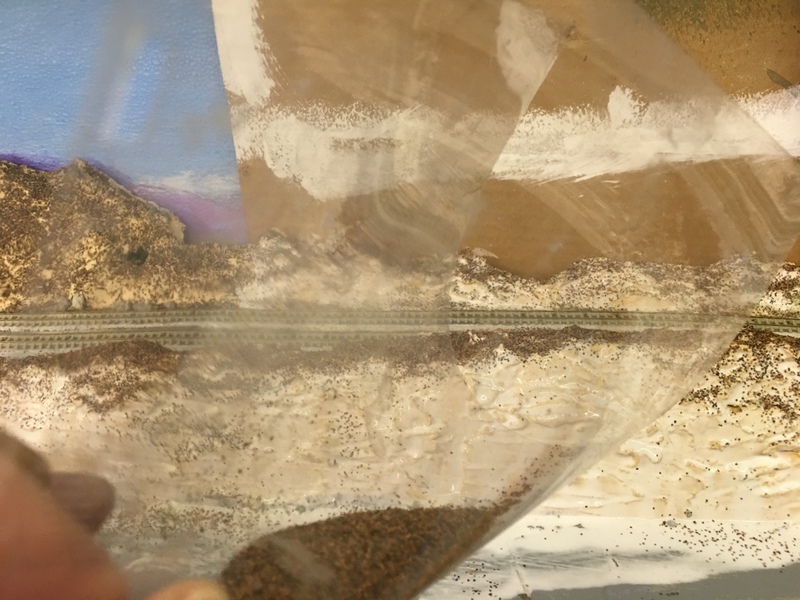 Some of the areas that are vertical will not attach the scenic material from the sifter. The best technique is to put some scenic material on an A4 sheet, bend the sheet and whilst blowing direct the material to the vertical surfaces. I use clear acrylic sheets for this purpose as below. Blowing scenic material onto vertical surfaces. Here is an example of just the base covering. It still looks pretty bland. 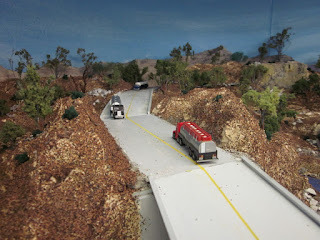 The next stage is to add layers of scenery materials. 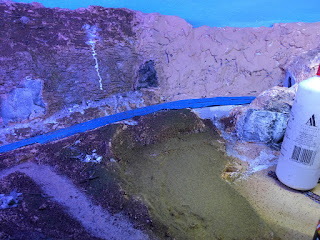 In this area I sifted on some fine brown - green turf to show some grass growing. As part of the layering of scenery I add talis rocks, small branches (made from small garden pruning), to simulate a natural ground. On the flatter areas I use static flock applied with an electrically charged sieve. 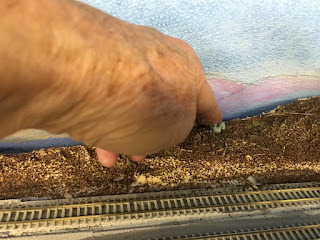 Note the area where white glue is applied to attach the flock. 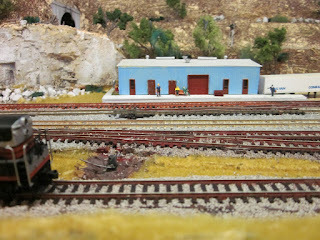 The grey area will be a gravel base for the old fuel depot. When all the base is complete it is time to wet it all down with 50/50 alcohol and water and drip on diluted white glue. 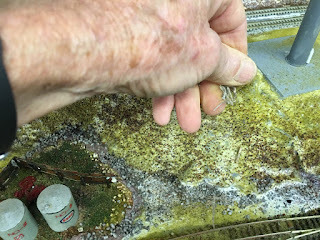 After wetting we then apply the 50/50 white glue to all the ground cover. 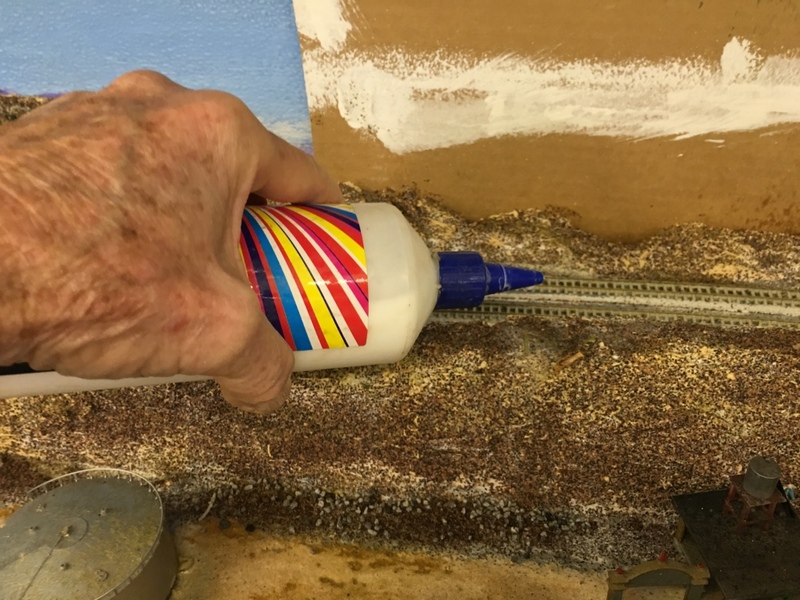 I am using a bottle that drips the glue. Many folks use a pipet to apply the glue. Either works fine. The 50/50 alcohol wetting helps spread the glue through the scenic materials. 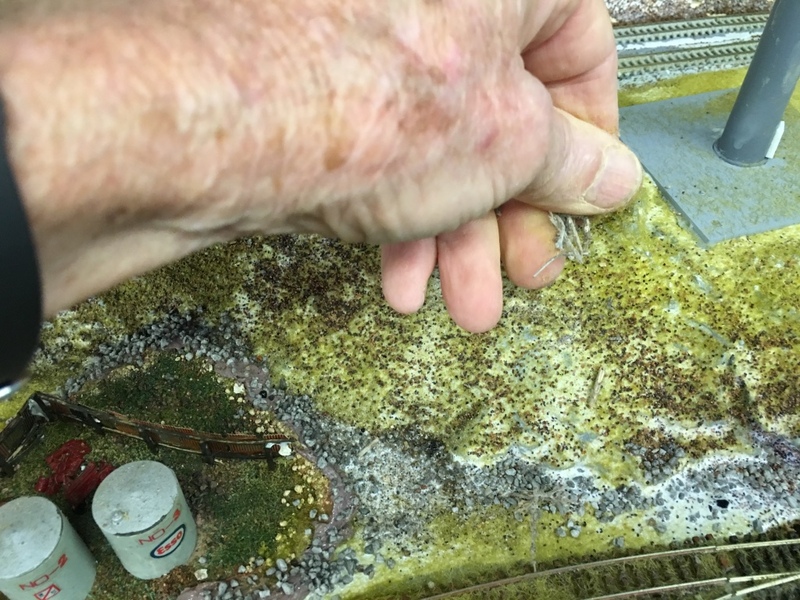 Final gluing of scenery base. 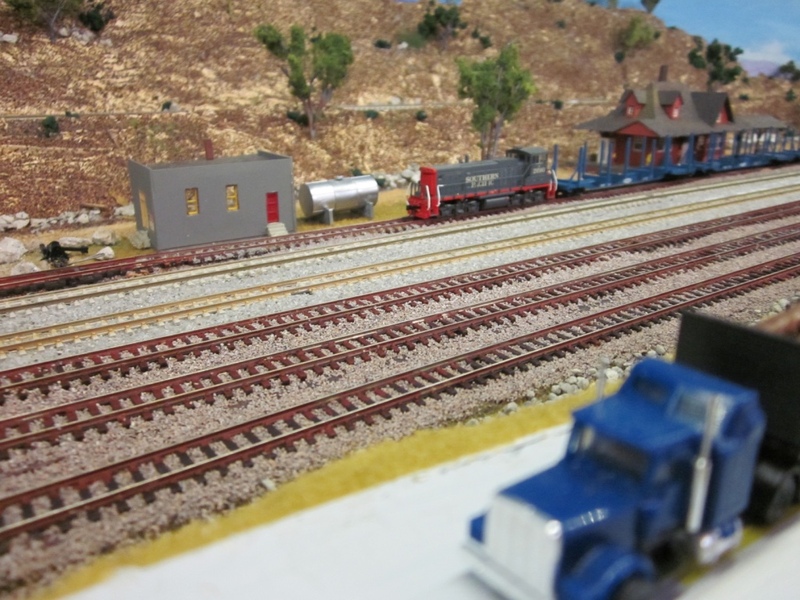 As my layout is set in Northern California I then add tuffs of grass bushes. 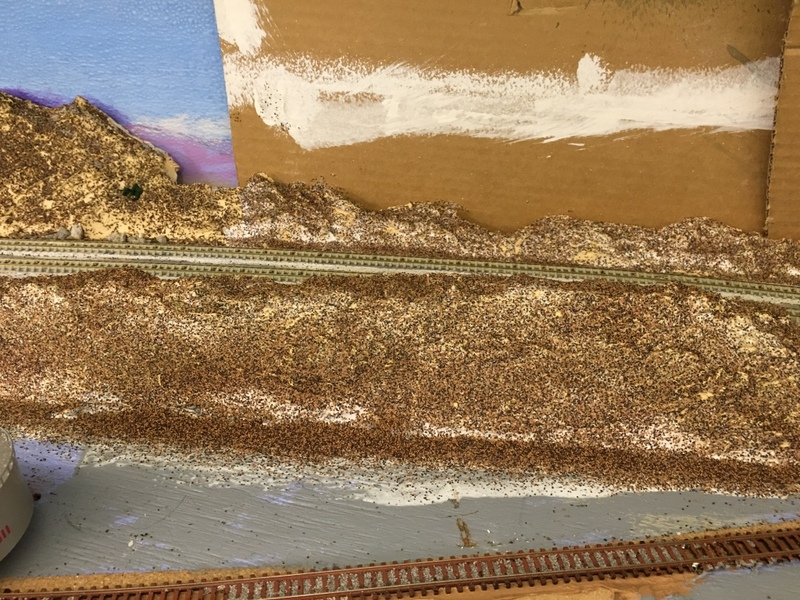 Again I use Woodland Scenics grass tuffs, and some I made from ground foam. 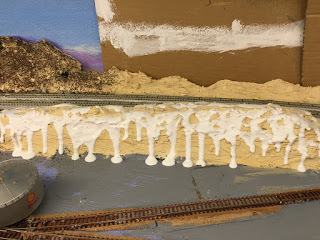 I fill a dispenser with white glue - add the tuffs and proceed to place them on the scenery. The next stage when all is dry is to add trees. 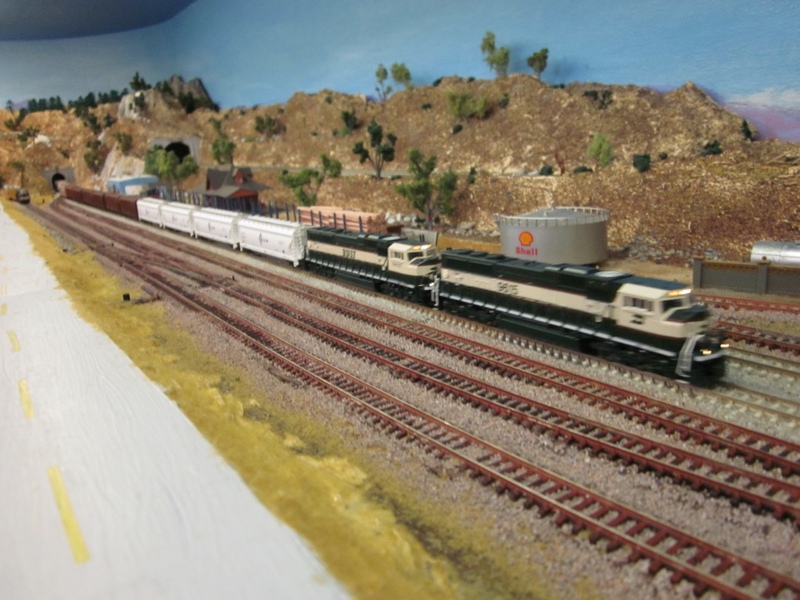 I have a combination of Woodland Scenics trees, "bottle brush" pine trees, and Scenic Express "Supertrees". All of these need to be made, but once you get the production line going they come together quickly. I must have over 500 trees so far. 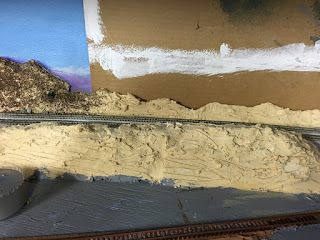 Next I ballasted the yard and mainline tracks. 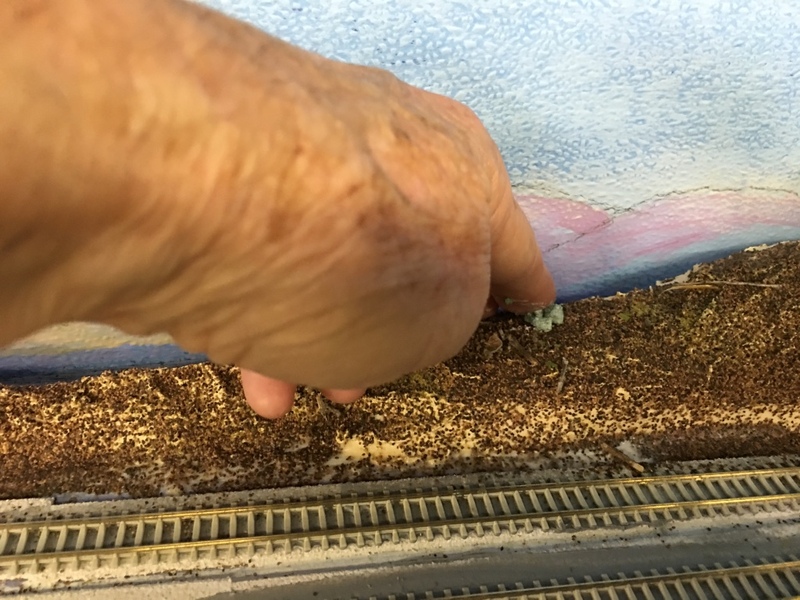 My mainline is modern concrete sleepers and a light grey ballast (Chucks Light Grey Ballast). 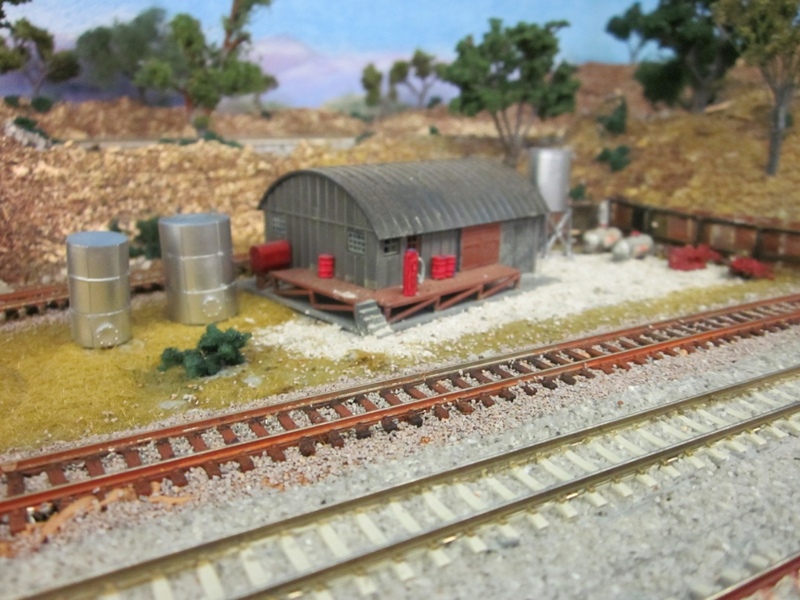 The yard is a darker grey - almost brown ballast over the wooden sleep tracks. I use a combination of "rust" paint and Woodland Scenics rail dispensers to stain the rails and take the shine off the sides. Beauville and Beccy Pulp "completed". 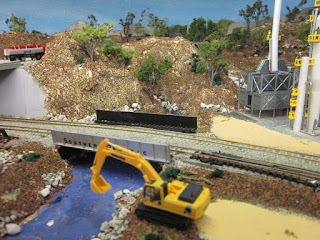 Here is a gallery of the completed section. In the overall view of Beauville below it is easy to identify the mainline and yard tracks. 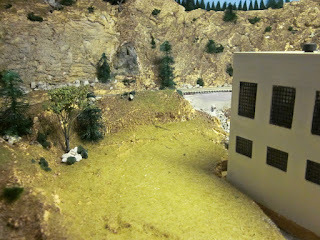 At Beccy Pulp the buildings are almost complete but the scene still needs people, and the buildings need weathering and signs.